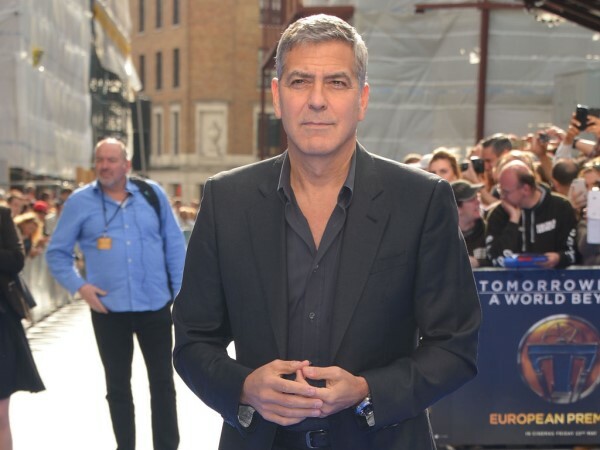 George Clooney is taking on the whole of Hollywood with his latest "heinous" prank. The 54-year-old actor is renowned for playing jokes on his co-stars and friends, with Brad Pitt and Don Cheadle among his victims. At the moment he's working on a joke of mammoth proportions and while he won't say what it is, he has movie stars across tinsel town quaking in their boots. "Right now I'm doing something so heinous, it's so horrible that there are many famous people all across this town right now who have framed photos of this hanging on their wall and don't have any idea what I've done. It's a horrifying one. It might be a federal offence, I might go to jail for it," he laughed to US talk show host Jimmy Kimmel. The two guys are good friends, mostly because they love being tricksters together. Jimmy has enabled some of the pranks George is most proud of, such as one he played on another of his pals - Matt Damon. This took place last year, but it remains a highlight of George's prank list. "This was when, not this Golden Globes but the Golden Globes before, when Tina [Fey] and Amy [Poehler, who hosted] did a joke about how - it was a [movie] Gravity joke - about how I would rather float off and die than be with someone my own age, it was a great joke. It actually was - I was glad I wasn't there at the time," he recalled. "So you [Jimmy] gave me Matt Damon stationary. Because one of the other jokes they'd said [was about Matt Damon], but it was a nothing joke. So I sent Tina and Amy notes from Matt saying, you know the George joke was OK but my daughters saw the joke you did about me and now they laugh at me and I thought it was really mean and it really hurt me. And then I got a package back of flowers and a note from Tina and Amy [to Matt] going, the first one, 'I'm really sorry, I didn't mean to offend.' And the next one said, 'But on the other hand we think this is from George Clooney so we're grown f**king women, f**k you.'" George also touched on his heartthrob status during the interview, with Jimmy quizzing him on what it's like to be many women's 'freebie' - the person their husband would allow them to sleep with if they ever bumped into them. The actor admits it's a weird situation, not least because it's usually guys who let him in on the secret. "There have been times over the years... husbands do that, that's the weird thing: 'My wife! She says you're her freebie!' And you're kinda thinking, what guy would say that?! It's a crazy thing," he laughed.